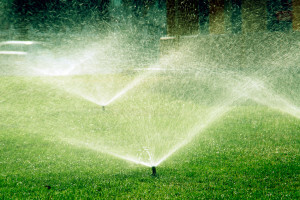 When watering the lawn, it should be given about 1” to 1‑1/2″ of water per week. Regular, fairly deep watering is better than daily light sprinklings. Deep watering and allowing the lawn to dry out between watering will force the roots to penetrate deeper in search of moisture. Early morning is the best time for watering the lawn so that the grass blades can dry slowly and naturally without too much evaporation. Watering the lawn in the evening can promote the spreading of lawn grass diseases. But if it is the only time of day you are allowed to water, then water in the evening, as it is better to be watering the lawn in the evening than not watering it at all. Areas of the lawn especially near sidewalks and driveways, under large trees and on slopes, take on a dull green haze. If extremely dry the lawn may appear yellowish. Footprints don’t spring back shortly after they are made.